I've waited a long time for this book. Pete Reid confided in me quite some time back that he and Tim were working on a book, and working hard on it. I knew it was about space, I knew it would be awesome and I knew it would be out around now. But that's all I knew. I wanted it to be a surprise, I didn't ask for any more info and he didn't offer. Well, it's finally in my hands and let me tell you, it's gorgeous. 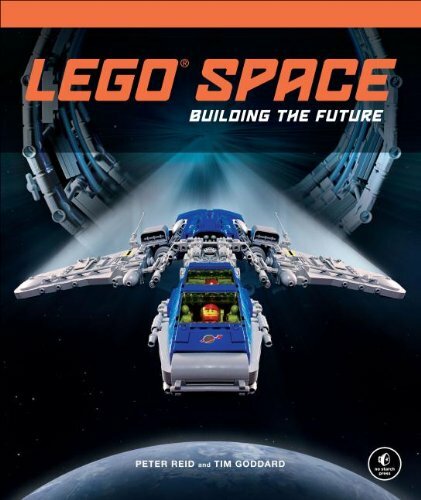 Two of the most talented space builders, Peter Reid and Tim Goddard (you may know them as Legoloverman and Rogue Bantha) have joined forces. With their expertly built, imaginative models and the photography of Ian Greig and Chris Salt, every page is an absolute treat. I knew this book would be epic, but I had no idea it would be EPIC. The amount of work that went into this is truly staggering. The quality of the book itself is excellent as well, with a hard cover, heavy weight paper, crisp images and stellar layout. Subtle touches like the glossy ship on the matte cover let you know you're holding a quality book. This is not a simple picture book or instruction manual, it's an imaginative vision of the future, and tribute to the past. The book is told as a distant history, looking back from the year 2527. 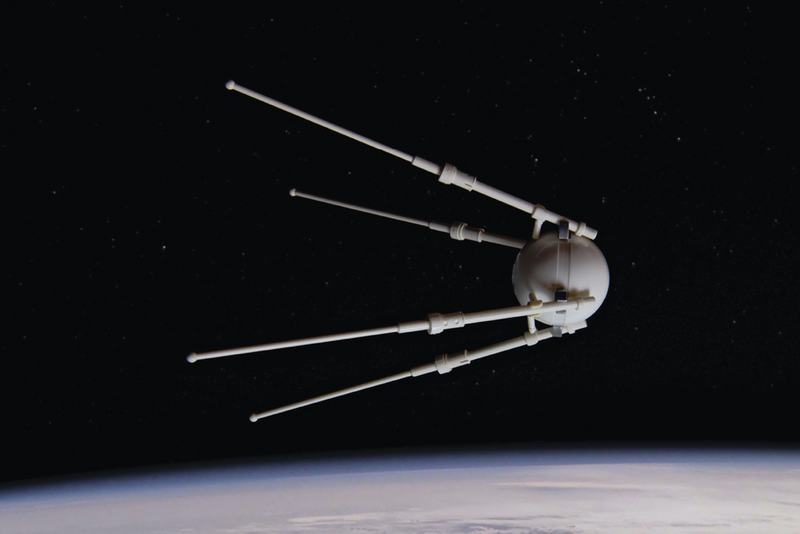 From Sputnik and the earliest days of space exploration to the assault on Panduro. The story is rich and detailed, and wonderfully presented. There are characters and plots, victories and defeats. There are ships and bases, robots and humans. There is a galaxy to explore. The models are, well what can I say, phenomenal. But I expected no less from these builders. And SO many, just when you think you've seen it all you turn the page and your jaw drops. If I have one criticism of the book is I would have liked to see one larger model as instructions. 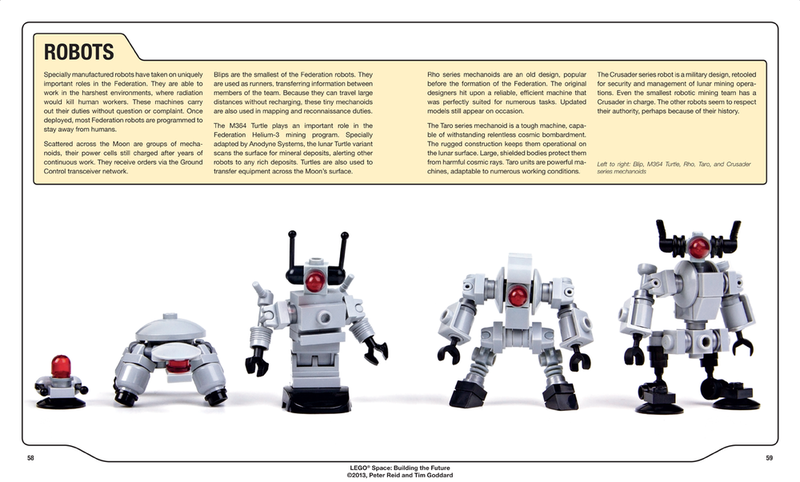 All of the instructions in the book are of small models, that fit in the palm of your hand. It would have been nice to see a section on the art of the corridor and bay as well. There's plenty of pictures of these amazing creations, it would be nice to get a little insight on how they're created. But these are pretty minor gripes. The directions are clear and well done, and very much like what you would expect from LEGO. The main difference is what might be called "illegal" techniques. You won't find an official LEGO model using things like the lever base without the lever, or removed Minifigure hands and hooks. But you'll find these advanced and out-of-the-box techniques in this book. It's really when a builder learns to embrace a little "rule breaking" that they take their building to the next level. I'm not talking about cutting bricks or modifying parts, this is just simply pushing existing elements beyond what they were intended for, and Pete and Tim are masters of this. I realize I've done a lot of gushing in this review. I also realize I'm probably biased because these are my friends. But I defy anyone to contradict me after looking at this book, it's truly a labor of love. I have no hesitation giving it 5 out of 5 Nerdlys.